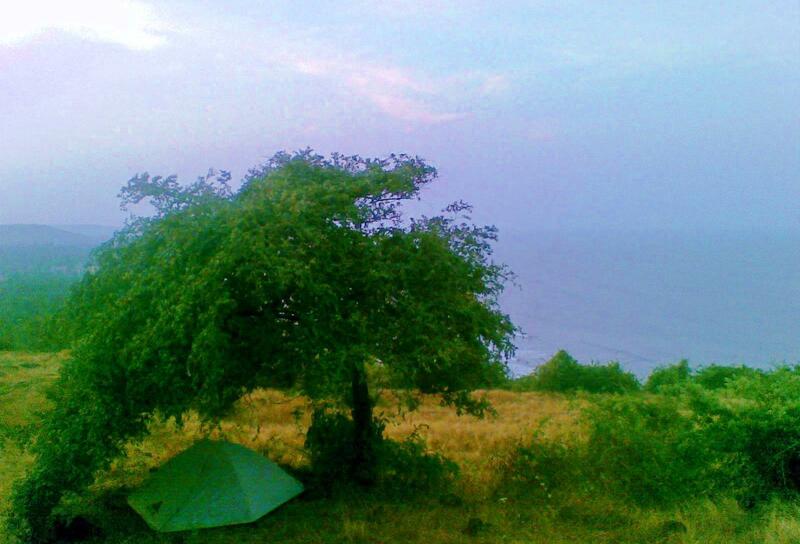 I moved my tent to a mountaintop cherry tree. Its branches drooped to the ground, which hid me completely, yet let me survey. Unending ocean waves crashing rolling booming far below, slow and timeless beneath the frantic sprint of the djimbe-drummers; prancing prehistoric shapes illuminated by bonfire. Hearing, other than the night tribe, only the wind and the waves up there, illimitable waves—zillions have crashed, still will be crashing in ten billion years—and the breeze, in its infinite moods and variable vectors upon which kitesurfer specks frolicked far from shore, caused shadows and light to dapple dance on the dome of my tent, inside of which I lay on a single thin mattress. Fasting and meditating; note making. Sunsets and dawnrises both. The sign of the Hermit again. I liked living outdoors, slept damn well; I’d retreated from all negative energies, found a Place. And some unencumbered free time and privacy to perform devotions to me. On a promontory tip past shredded prayer flags fluttering from the branches of a single large oak sat a white stone shrine. Decorated with cheap trinkets deposited after a zigzagging mountainclimb. Dawn mist and breakfast smoke burned away, and the brown earth scorched. Bones of dead cattle and broken rock wall littered the landscape. Interestingly textured ground. So many bones. I collected and arranged the best specimens, which were picked clean by carrion eaters and sun-bleached, some still stuck together, joints notched perfectly like Legos. I extracted teeth from long bovine jaws, which were square and large and yellow-rooted, and hung these from shark finned spine chunks like ornaments. Like the hands of a little bone man emanating an aura of spiritual calm. No one tended the land. Only occasional green clusters thrived sparsely upon the harsh windswept plain. One of these oases was my encampment. An umbrella-like gazebo of a cherry tree set far back and away. Its thick boughs shielded me from the fierce sun, and were heavily laden with semi-sour fruit. I arranged my tent so as to be invisible. Even with high-powered binoculars, and knowing exactly where to look, I was cloaked. I took care not to show light at night. Nobody knew where I was. Except a troupe of macaques. Who descended from the plateau through the tall grass scouts first, chattering, loping along on all fours, sitting squat style awhile, waiting for the others to catch up. Desultory-cautious in a place to which they were accustomed. Mississippians. Gathering and gobbling handfuls. Like humans at banquet. The youngest stared curiously. He couldn’t quite make me out but knew there was something… I made soft clicking noises, mimicking his language, and he pricked up. Squinted his eyes and cocked his head in such a homo sapien gesture I nearly laughed. I clicked friendlily at him some more, but he could not quite summon the courage to approach any closer, and instead called to a bigger cousin; another few clan members joined them, the bolder ones came right up to my screen window and sniffing cautiously. I didn’t want to alarm them, so I betrayed myself by a slow movement, which precipitated an immediate outcry. Those closest to the tent were off like lightening, the ones in the tree leapt down and bounded away like kangaroos, everyone retreated to a safe distance and posted; it was clear they were reluctant to leave without having fed to satiety. So I lumbered out and very slowly stood up to my full height, in order that they would see what I am. More frantic bolting ensued, and in a flash they all disappeared except for the dominant male, who regarded me from a hundred yards distance to see what I would do, which was: sit on a rock, and watch him right back. The macaques stayed away for a time, but the bounty proved too difficult to resist. I took care to sit still whenever they came by, observing but not disturbing them, respectfully co-inhabiting the space. In this way we made a tenuous peace, and I was delighted to have them as guests, except that it seemed an inordinate number of seeds got ‘accidently’ tossed onto my tent and stuck there and rotted, which caused a pleasant sweet odor, which attracted a never ending procession of fat ants, which snuck past the zipper and tormented my bed. These ants earned an interesting living. Their technique was to bind a cluster of cherries with gossamer while it was still on a branch, so that it would not fall once ripe. Instead, the fist-sized silken blob would slowly become a sugary pulp, upon which the insects would gorge. The ants themselves however tasted quite sour. I fetched water from the Banyan Tree stream, bathed naked there, and selected my feed as it ripened. Each day, twenty or so new ones would be ready. Which was plenty to live on, though my body did melt a bit. In the shade of aum cherry tree / breeze rustled leaves / I gazed like a skeleton to sea. Allen McKenzie is a traveler. Over the years he has discovered various ways to skin cats, some of which are considered more or less socially acceptable. He has authored five gonzo books, including ‘Polyamori’, which is currently available on Kindle for less than the price of a cup of coffee. Although utopia is no place, he currently resides in Seattle.